In honor of Cooking in Cleveland's food blogging event, I'm entering my Strawberry Wine as a submission. Enjoy! A few people have been asking me about making wine. To catch you up, I taught myself how to make homemade wine a few months ago and it’s been so far “so good”. 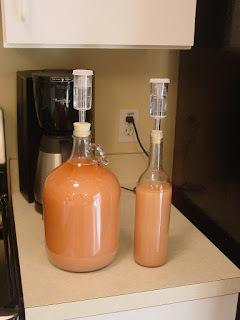 The thing about making homemade wine is the fact that you won’t know if you’re really any good at it for some time, so this isn’t a hobby for the impatient. That’s perfect for me because I’m impatient as hell! It doesn’t really take elaborate equipment, but it does take time to make something decent. If you can read and follow a recipe, then you can make wine. 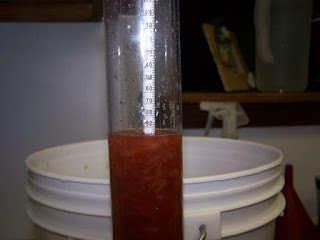 I knew before I started that I wanted to make Strawberry Wine. GOOD wine though, not “Grandpa Jaja’s Elderberry Hooch”! I wanted to make wine that would be decent to serve at the dinner table or give as a gift, so I started researching and reading and asking questions. Most of the ingredients are right at hand, but unfortunately you won’t be able to simply reach into your pantry and whip up a batch of wine without a considerable amount of research and preparation. Once you get the hang of it, it’s no more troublesome than canning or preserving, but with a longer shelf-life. And once you get started, the possibilities are endless! So, I’m not going to bore you with details regarding the recipe, as most homemade wine ingredients like tannin powder, potassium metabisulfite, and pectic enzyme have to be purchased from a wine hobbyist vendor. 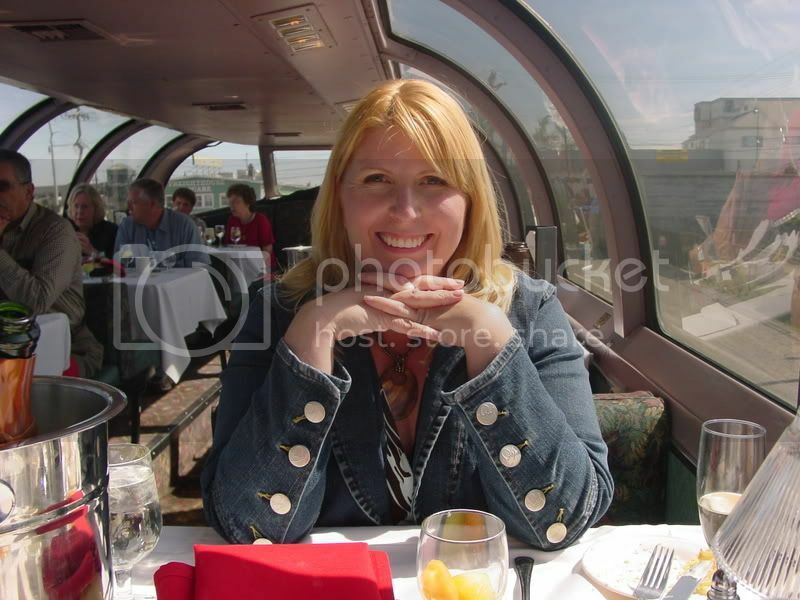 But I will give you a pictorial of what it was like and what the end result looks like! 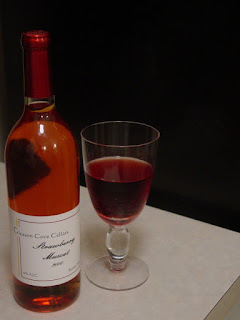 If you’d like to take this further and possibly give Strawberry Wine a try, go to Jack Keller’s website and search for his Strawberry Wine recipe. I used his recipe when I made mine and he’s a very reliable source. 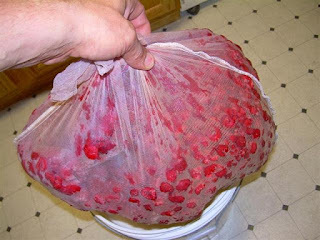 Ok, first, you get a big ol’ cheesecloth bag full of strawberries and you add it to your primary fermentor (a food-grade plastic bucket). 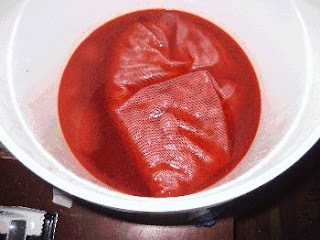 You then pour some simmered water with your required amount of sugar over the strawberries, add the rest of the water, other ingredients and wait 24 hours. Then you use what’s called a hydrometer to test your potential alcohol level. 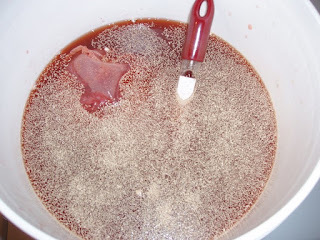 Yeast turns sugar into alcohol, so therefore; the more sugar you add, the higher the alcohol level will be in your wine. Typical table wine is around 12% total alcohol, so you can use your hydrometer to adjust your sugar levels appropriately. Then you “pitch the yeast”. See the dry yeast on the surface? It’s no different than a packet of bread yeast, but it is NOT bread yeast. You’ll end up with hillbilly hooch if you use bread yeast. Use wine yeast, it’s important! Then you wait. Primary fermentation can take anywhere from 2 days to 6 months, depending on a whole bunch of factors. Mine took about 4-5 days. Then you check your potential alcohol level (called a specific gravity) again, and when it’s at the right spot, you pour your wine “must” into a secondary fermentor, which is usually a glass jug. Add an “air lock” to prevent air from oxidizing your young wine and wait again. Notice how cloudy it is? It takes some time for all the sediment to settle to the bottom or “clear”. Once this is done (anywhere from 2 months to 2 years! 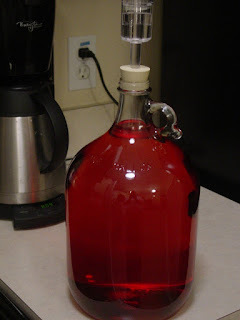 ), you siphon your wine off the sediment into another glass jug, stabilize it so it won’t referment (more additives), sweeten if need to, and bottle. Now, the truth is, that glass next to my bottle isn't my Strawberry Wine. For the most part, young wine really doesn't taste what it supposed to and it needs time to age. My lovely Strawberry Wine should be tasty come around Thanksgiving, but from the tiny tastes I made before bottling, it should be a huge hit! I was hoping you would enter your wine. Thanks so much for entering it in the Strawberry Moon Festival. Thank you! It really is easy, but can be a bit complicating in the science department. There's still a whole bunch I am still learning, but it is FUN! Right now, I have a WONDERFUL 3 gallon batch of Banana Grigo that I'm going to bottle next week. It is yummy! This one's an early drinker. I have a batch of Lemongrass Mint going and yummy 3 gallons of Ancient Orange Spice Mead fermenting right now.